Inducted 2001. Named Most Valuable on Fencing Team at University of Illinois. Class of 1970. Kemner walked on to the University of Illinois campus with no experience in the sport of fencing, but he left as one of the top fencers in the school’s history. Kemner, a 1970 graduate of Notre Dame, played on the football team and ran track during his high school days. When he went on to the U of I, he walked on to the fencing program and developed his skills under the guidance of Max Garret, the 1960 U.S. Olympic team coach., and Arthur Schankin, a three-time All-American in the 1950s. He earned his first varsity letter in 1972-73 season after posting a 23-23 record in the No. 3 and No. 4 positions for the Fighting Illini, who won the Big Ten title. Kemner improved to 21-18 the next season in the No. 3 position as Illinois won its third straight Big Ten title. In 1974-75, Kemner was named the captain of the team. He fenced in the No. 1 position on the saber squad, compiling a 25-5 record. He went 8-2 to earn the Big Ten individual championship in saber and led the Fighting Illini to another conference crown. He was selected to the All-Midwest saber fencing team and was named the team’s most valuable fencer. Kemner qualified for the 31st NCAA National Collegiate Fencing Championships, which were held April 2-3, 1975, in Fullerton, Calif., but Kemner didn’t participate because the team was snowed in at Chicago’s O’Hare Airport. 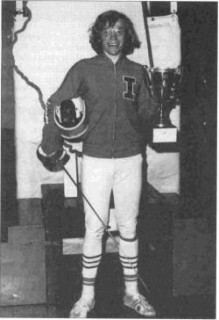 Kemner served as an assistant coach on the fencing team for one season before graduating in 1976. He now lives in Peoria Heights, Ill., with his wife Jennifer and daughters Bridget and Gretchen. He is a research engineer for Caterpillar. Thanks to the selection committee for recognizing my achievement. Thanks to my parents Jennie May and Bill Kemner and my family who are still here today for their moral support. Thanks to my coaches at the University of Illinois — Arthur Schankin, Max Garret and Lee Sentman. They were willing to spend the time to develop my skills that enabled me to experience the thrill of winning the Big Ten Championship. Thanks to my coaches and teachers at Christian Brothers for kindling a spirit of competition and an opportunity to compete in athletics. And thanks to my brother Tony for the encouragement he gave me throughout my life. I wish here could have been here to share this moment. He died last spring, but I know he is still looking out for me as I continue my own journey through life.